See this? 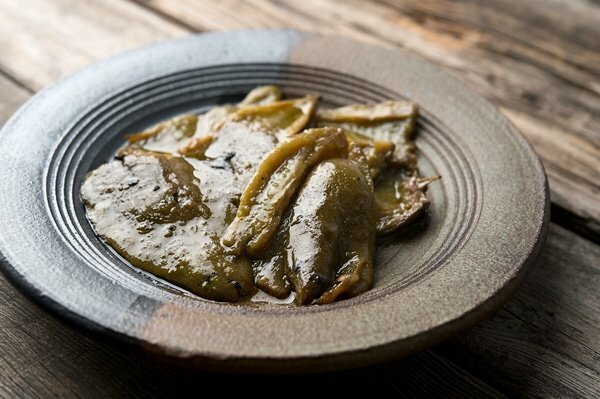 It’s a plate of jalapenos that have been fire-roasted, smoked and preserved with a little vinegar and olive oil. Sound like a lot of work? Maybe. But if you make these you will be blown away. I’ve been making preserved, fire-roasted jalapenos for several years. They are a fantastic addition to all sorts of things, like chile verde, tacos, fajitas, chili, or, to stray from Mexican food for a moment, on a sandwich with some cheese, with charcuterie — or hell, just on crackers. If you’ve ever had those jars of roasted red peppers, it’s like that, only the jalapenos are green and spicy. 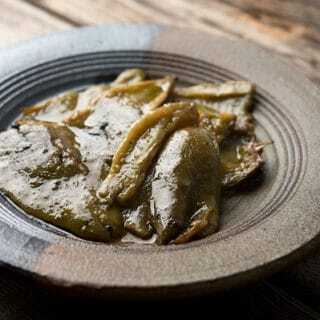 This is different from a typical jalapenos en escabeche in that it’s less vinegary, and a little more smoky. Smoky… Last year after I roasted a bunch, I looked at my smoker and thought, “Hey, why not?” After all, chipotles are nothing more than smoked-dried red jalapenos, right? So I put the roasted peppers in the smoker for a couple hours: Not enough to dry them, but enough to get them nice and smoky. Holy crap they were good! And hot. Jalapenos are notoriously variable in their heat, and you really never know if you’re going to get a fiery one or a glorified bell pepper. The only reliable way to suss out the super hot ones is to look for the stretch marks on the chile: Those stretch marks are signs of stress, and a stressed chile is a hot chile. First you need to fire-roast your chiles. Start by oiling them up and setting them on a hot grill. If your grill isn’t super hot, you can close the lid, but I find this roasts the chile a little too much. 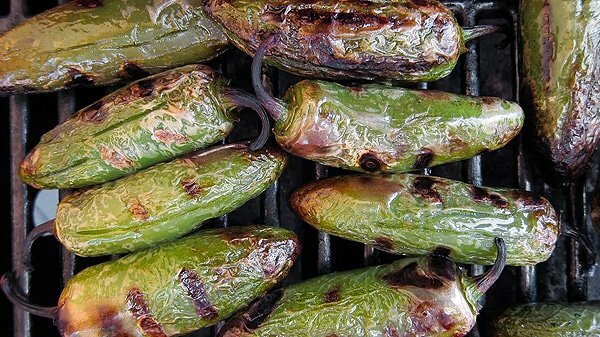 If your grill doesn’t really get blistering hot, lay the jalapenos right on your stove’s burner grates and blast them with the heat of a gas stove. This works really well at charring the skin without overcooking the pepper. You’re ready to rock when the skins are coming off. Move the chiles to a paper bag or a large bowl that you can cover. Let them steam for 30 minutes or so, then peel and seed. Now move them to a smoker for a couple hours. What wood? Mesquite is an obvious choice, but anything will do, really. Once the jalapenos are smoked, to preserve them you dredge the peppers in vinegar, salt them well and pack into a glass jar. 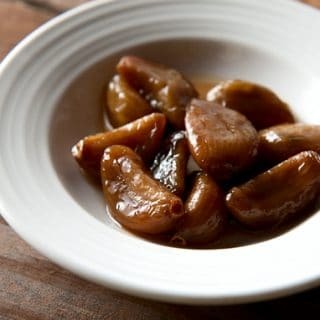 Cover them completely with olive oil and they will keep in the fridge for almost a year, although they soften over time. It’s jalapeno season, folks. Make these and eat some. I’d bet money that if you do, you’ll want to put up a few quarts for winter. Obviously this is a recipe for jalapenos, but any pepper that you can get the skin off will work, too. If you don't want spicy, do it will bell peppers. I've done this with red peppers and it's awesome. Serranos work, too, but they're fiddly. Poblanos, Hatch and Anaheims are good alternatives. Coat the jalapenos in some olive oil and grill them over very high heat until the skins blister and char. Alternately, you can do this over the burners of a gas stove. When the skins are charred, put the jalapenos in a paper bag or large bowl and cover it. You want the jalapenos to steam for 30 minutes. Put on rubber gloves if you have them. I am largely immune to the effects of chile oil on my hands, but dealing with so many chiles affected even me. So my advice is to wear gloves. Rub the skins off the jalapenos near the sink. Don't rinse the chiles, as this removes a lot of flavor. Just rinse your gloved hand from time to time to get stray bits of chile skin off them. When you're done, remove the stems and seeds from the jalapenos. Arrange the jalapenos on the grate of your smoker. Start with the smoker cold, and bring the temperature up gradually to between 200°F and 225°F, for a total time of 1 to 3 hours, depending on how smoky you want them. I smoke for 2 hours, with the last hour being around 200°F. Once this step is done, the jalapenos can be kept in a jar in the fridge for 2 weeks or so. 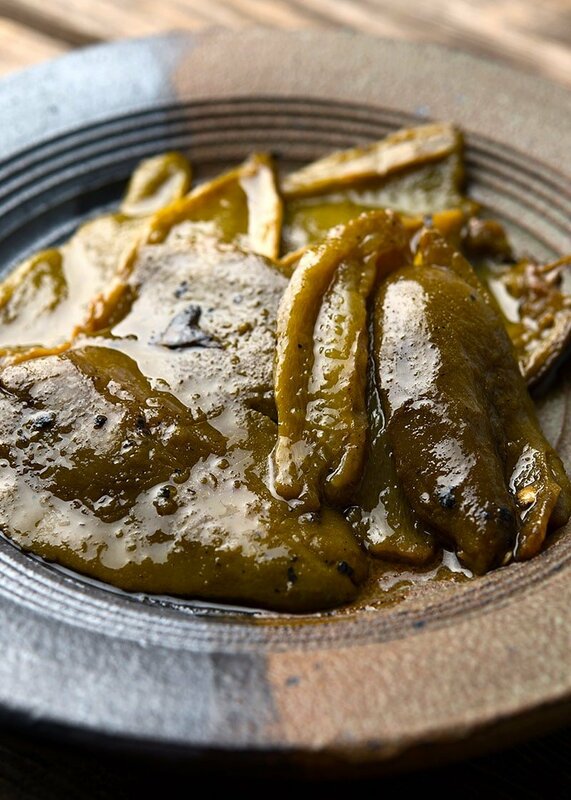 To preserve them longer, pour the vinegar into a rimmed baking sheet and lay the jalapenos inside to coat them. Leave them there for 5 minutes. Set another baking sheet out and move the jalapenos to it. Sprinkle the chiles with salt. Pour a little olive oil into a clean Mason jar. Pack the jalapenos into the jar, covering them with more olive oil. Leave no air pockets. I find that using a chopstick to poke around releases any trapped air bubbles. Cover the jalapenos with 1/2 inch of olive oil and close the lid. They will keep in the fridge for a solid 6 months, and I've used them after a year and they were OK.
You can find dozens of recipes for pickling, preserving and other ways to save your harvest all year, right here on Hunter Angler Gardener Cook! These jalapeños have become a staple at my house. I will be planting more this year just for this recipe!